The life expectancy of Americans decreased in 2015, compared to 2014—the first drop in over two decades. The newly-released report also shows mortality rates were up for most of the 10 leading causes of death. 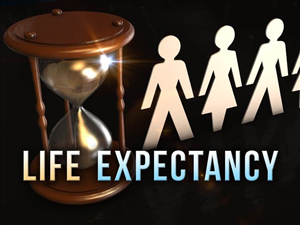 The data released by the National Center for Health Statistics on Dec. 8 shows that life expectancy in the United States dropped last year for the first time since 1993. Americans are now expected to live an average of 78.8 years, a figure that represents a one-tenth of one year drop since 2014. Women now have a life expectancy of 81.2 years, while men are expected to live to an average of 76.3 years. The overall death rate also rose 1.2 percent in 2015, with a total of 2,712,630 resident deaths registered—86,212 more than in 2014. This represents the first uptick in the U.S. death rate since 1999, with 45 percent of the deaths being caused by heart disease or cancer. 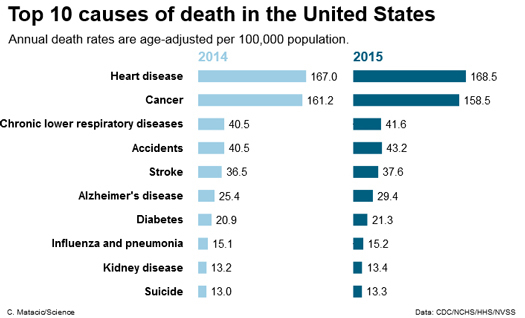 The data examined the top 10 leading causes of death in the U.S. They remained the same from the previous year, with eight of them growing in the number of fatalities they caused. Those were heart disease, respiratory disease, unintentional injuries, stroke, Alzheimer’s disease, diabetes, kidney disease, and suicide. Cancer, the second leading cause of death of the studied diseases, killed more than 595,000 people in 2015, but its death rate still dipped slightly from 2014. While death rates rose for White men, White women, and Black men, they stayed essentially the same for Black women, and Hispanic men and women.